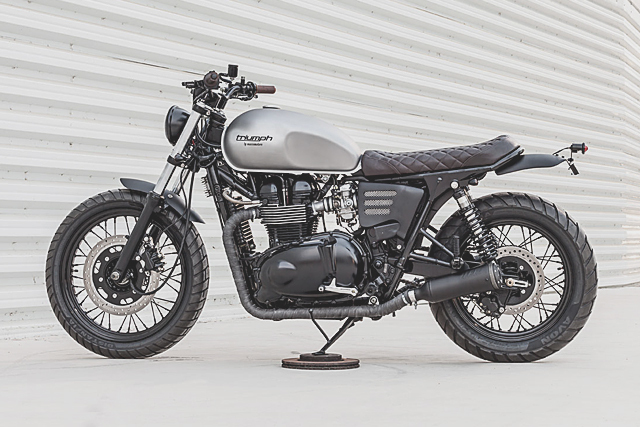 For 2016, the Triumph Bonneville has finally shed its air-cooled status and embraced a raft of new technologies that brings the engine of the retro-styled machine truly into the 21st century. 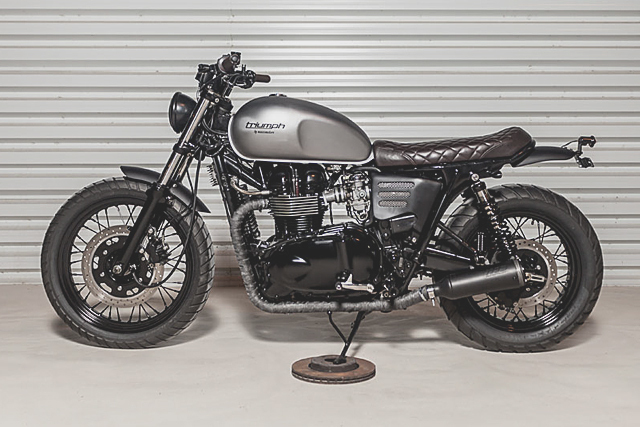 It’s a brilliant machine that will no doubt sell like hot cakes, but with such a change there is also a chance for a new bike to become a modern classic. 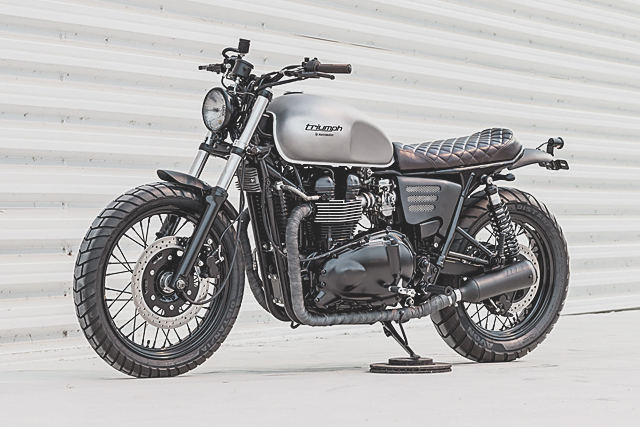 That very well could be steeds like this “new” 2004 Triumph Bonneville. With no electronic aids, no fly by wire and carbies for induction it is perhaps the true bridge between the old classics and the new retro-tech masterpieces. 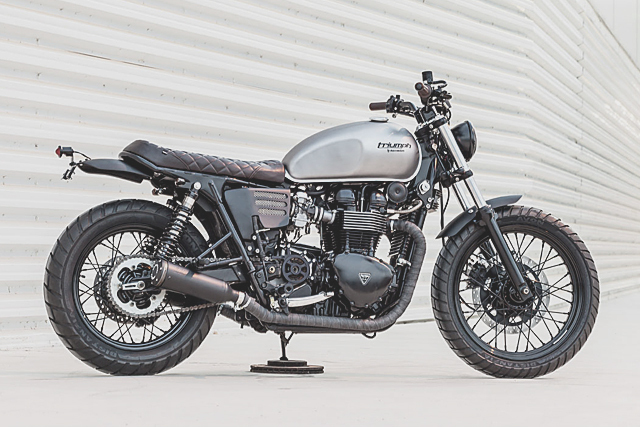 Either way, Macco Motors in Spain sure know how to turn out a brilliant Bonnie of any vintage and this little lady known as ‘Wayra’ sure likes her hair in the wind. 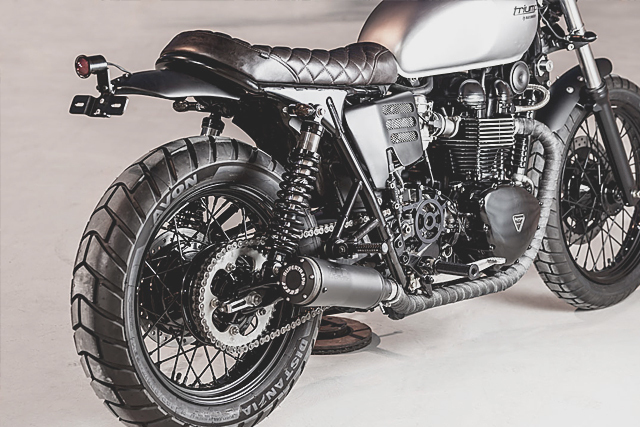 Like many of their customers the owner of this bike is not from Spain, but having fallen for the distinct styling of Macco’s builds, Matthew a London lad, commissioned Jose and Tito to build him an ultra clean Bonneville in their clean Spanish style. 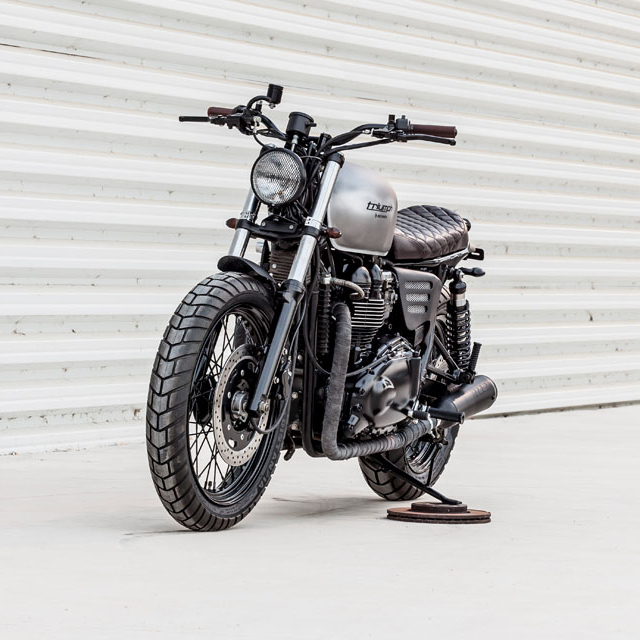 But as the boys explain simplicity can take a lot of work “We worked more on this bike than on others, and then the result is even simple.” But there is a beauty to a well-built Bonnie that can’t be denied, the look is timeless and stripping back the layers only seems to intensify its presence. The stock tank remains in place but rather than juggle with colour samples nothing says simplicity like no paint at all. 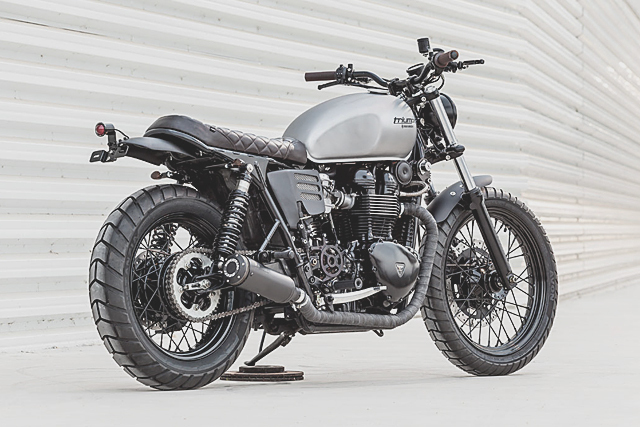 So with plenty of stripper and sanding, the end result is a raw steel finish with an elegant Triumph by Macco Motors graphic logo laid down in black. The rear end styling is classic Macco, the subframe has been chopped and in its place a new kicked up hoop has been welded in. The boys have it down to such an art that for all intents and purposes it looks factory, right down to the welds and paint. 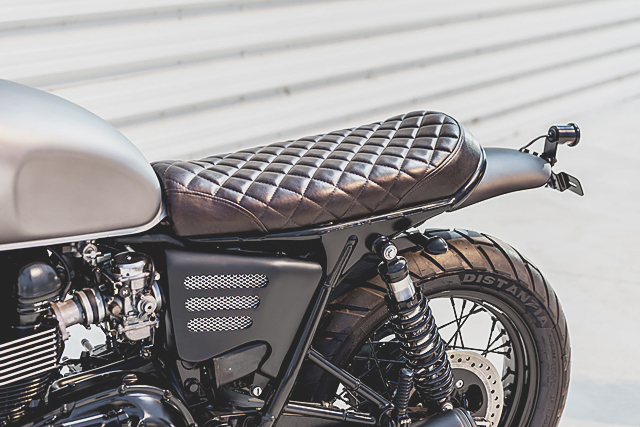 Sitting atop the new rear end is one of their in-house crafted seats, the pan is shaped before being layered with foam and then a hand stitched, diamond patterned, rich chocolate leather laid over the top. The bulky stock fenders then got shown the door and have been replaced front and rear by fibreglass items that Macco make and sell in-house. Many a one model build means a shop can start to create a catalogue of parts for that bike and the side covers fitted to Matthews ride are another from the Macco collection, fibreglass and vented. Powering Wayra, meaning wind in Quechua, is the Bonniville engine with a little more air capacity, the 900 motor. With a true 865cc displacement the difference is largely the torque in the lower gears as opposed to any great speed advantage over the 790cc engine. The carburetor fed motor remains largely standard but thanks to a pair of wrapped pipes finishing in Supertrapp mufflers the thump of the parallel twin is hard to miss. Tidying things up is a big part of any Macco build and the ignition and rectifier have both been relocated. Showing off some of the raw mechanicals is the open LSL sprocket cover, it’ll protect your leg but don’t go sticking your fingers in there! Making the bike a comfortable ride Macco have tricked out Matthew’s workstation with more than a few modifications. Starting is now achieved thanks to a small single button while over on the left, light controls are simplified thanks to an enduro switchblock. The bars themselves are 22mm Renthal items that necessitated a shift to a pair of LSL risers while the brown gum grips by Tomaselli are a nice match to the leather-bound seat. 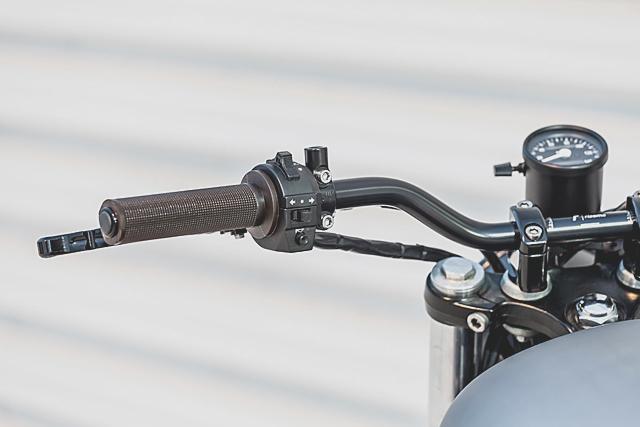 The fully adjustable race style levers make two finger operation much easier and the new master cylinder provides a clutter free look matched alongside the single analogue speedo. With his feet planted on the new alloy rearsets Matthew lights the way with a grilled out Bates style headlight and mini turn signals front and rear. It wouldn’t be a classic looking Triumph without the spoked wheels and the hubs, rims and their laces have all been blacked out in new paint. While the beefy liquorice they wear is the ultra versatile Avon Distanzia Dual Sport tyre, perfect for the full mix of London weather. With the rubber fitted and the bike checked the Bonnie could leave Spain a new woman and head home to her natural habitat in the UK. For all that has stayed the same about the Bonneville over the years it’s hard to imagine the lads at the Ace Cafe circa 1960’s sending their Triumphs across the channel for a custom build. But the internet has made the world an ever shrinking place and a British bike, with Spanish customisers, for you to feast your eyes on in whichever continent you may call home is just how we roll in 2016!